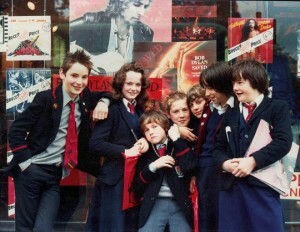 School kids outside Bruce’s, Princes Street. The only thing I am sure of is that I want Avalanche to continue to attract younger customers. Whether they are buying Arctic Monkeys posters, Bright Eyes badges, Biffy Clyro and Smiths vinyl or Frightened Rabbit CDs what is great is that they feel the shop is somewhere they feel comfortable spending time. My main issue with much of the publicity for record shops is that it reinforces stereotypes that they are for older men and hipsters. We get plenty of the former and not so many of the latter but also a lot of kids and students who are still feeling their way and not only feel comfortable asking questions but hopefully have no fear of being mocked for liking “the wrong music”. As with the many visitors we get I recommend music I think they will like not music they should like. There is still life here. More than that, there’s hope too – and perhaps the best evidence comes from the mouths of our two young friends, the ones for whom even Britpop was an obscure, pre-natal event. To have a shop serious record shop enthusiasts think is a “proper” record shop but at the same time not put off youngsters is no mean achievement that I’m very proud of. The other directions we take are to some extent currently out of my control. How much we concentrate on new releases will depend on the HMV/FOPP situation. I hope that those who have visited the shop because of the dearth of vinyl in FOPP and have been impressed continue to return. The website has been very well received and I aim to do more with that later in the month. Again marvellous support from customers. The gigs we have had in the shop so far have been a huge success showing what a difference the support of bands can make. Frightened Rabbit continued that theme with the release of their new album. Other bands and labels may take another route but so long as we can offer our customers the same releases at the same time and at the same price we will continue to do all we can to promote Scottish music. There is of course much more and once things are clearer with regards to HMV and FOPP I’ll be able to say more. As ever I can not thank customers, labels and bands enough for their support. Believe me it is what makes the difference.